Max is on her way to stay with her great-aunt Elodie in Istanbul; a great – aunt she has never met but whom her mother describes as “a very difficult woman”. Of course Max cannot travel by herself – enter Sister Marguerite, a very unusual sort of nun. This is the start of a very unusual adventure in which Max (with Sister Marguerite) must pit their wits against a master-thief as they travel from Paris to Istanbul via Munich, Budapest and Bucharest. But which of the other travellers on the train could it be? 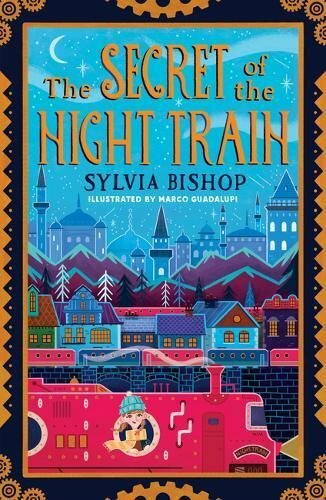 Sylvie Bishop is fast making her name as a creator of lively, quirky adventures and The Secret of the Night Train will only help to confirm this. Setting her story on a train that will travel across a number of countries allows her to people it with a varied and even exotic cast; there is more than a little nod to the grande dame of the detective story, Agatha Christie but appropriately fashioned in the Blyton mould. There are mistaken identities, suspicious characters, a stolen diamond, even an unpleasant old lady (surely a villain?). The plot twists and turns pleasurably held together by the determination of Max and the jeopardy is neatly balanced by a strong vein of humour. The prose is rich, deliciously readable and is delightfully enhanced by Marco Guadalupi’s illustrations which capture the flavour of the narrative to perfection.